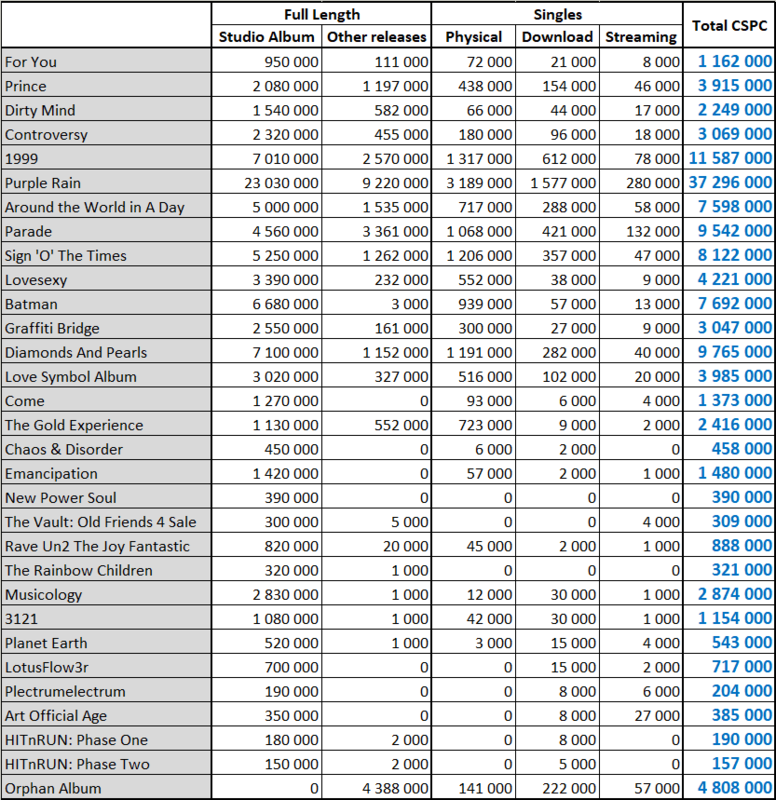 So, after checking all the figures, how many overall equivalent album sales has each album by Prince achieved? Well, at this point we hardly need to add up all of the figures defined in this article! In the following table, all categories display figures that way, e.g. in equivalent album sales. For example, singles from Night Visions released in digital format sold the equivalent of 4,367,000 album albums – 29,110,000 downloads with a 10 to 1,5 weighting. Purple Rain emerges far and away as Prince‘s most successful album. It registers over 37 million sales on the back of all formats. The album continues to sell well and its streams started off strong since its wide availability from February 2017. We tend to say that the 80s legend has been strongly inconsistent. While Purple Rain is a one-in-a-lifetime blockbuster, follow ups are numerous and solid. There is as many as 6 albums fighting for the second spot. 1999, Diamonds and Pearls, Parade, Sign ‘O’ The Times, Batman and Around the Word in A Day, in that order, range from 11,5 million to 7,5 million. The average of these 6 albums is over 9 million which shows the singer has been widely popular during many years. Actually, every album from 1978’s For You to 1994’s The Gold Experience reached at least 1 million equivalent album sales. From 1981’s Controversy to 1992’s Love Symbol Album every era topped 3 million EAS. The average per release dropped drastically after his departure from Warner. The artist got one more comeback with 2004’s Musicology. Frozen for several years due to the lack of its availability on all formats, the recent arrival of the record on Spotify & cie may push it over the 3 million mark at some point. Over a career of 38 years plus 2 seasons of posthumous sales, the mastermind amassed 131,92 million equivalent album sales. An incredibly innovative artist that shared new sounds, new formats (he sold downloads virtually before anyone else), new concepts, and new promotion methods, Prince managed to combine all his experiments with highly successful records during his extensive career. Thanks to our new ASR (Artist Success Rating) concept, we know that their sales represent 21,81 million times the purchase of his entire discography. Coupled with his total sales, it translates into an ASR score of 304. This puts him ahead of other legends like David Bowie and Bob Dylan. Additionally, the following pages list their most successful songs as well as their records and achievements. Do not forget to check our amazing cross-artists lists posted inside the CSPC: Data Collector which includes the full listing of all CSPC results compiled so far. As usual, feel free to comment and / or ask a question! Sources: IFPI, Spotify, YouTube, Discogs, Chartmasters.org. Wow the jump from Controversy to 1999 is amazing! Did you sit and add up all these numbers? Équivalent sales here means only that by a strange system hé adds to the albums sales (which are highly disputable here) the singles sales and streaming. Of course this system discard the greatest Hits sales. -the Guy invents his system of équivalent sales, but yet still refuses (I argued with him à lot back in 2005/2010!) To account for the 1.6 millions Musicology sold through Billboard. Means singles or songs not released on his studio albums. Looking through the methodology, I don't think it discards greatest hits sales - it distributes them to studio albums (or "orphan albums" in the case of songs that weren't on studio albums) based on Streaming numbers of those songs. So sales of The Very Best of Prince, for example, would be allocated to Prince, 1999, Purple Rain, Around the World in a Day, Parade, Sign o' the Times, Lovesexy, Graffiti Bridge, and Diamonds and Pearls proportionally to the streams of the tracks that are included on it. I think that's what the "other releases" column is, which explains why there are so few for Batman and none for Come, for example. How accurate are these numbers do you think? With reissues and promotion of reissues of albums like 1999 and DIAMONDS & PEARLS they very well could reach the 10 million and over mark. Out of curiosity, did someone ever calculate the median income of Prince on his records? I've always wondered since he's the writer, composer, performer, arranger and producer. He's not cashing in as your regular rock star. I've been quite suprised with the 200 million USD evaluation, but yeah, given the figures, it makes sense. Which means he was burning money like crazy in the nineties (and it recoups with Kevin Smith comments on how much videos Prince had fully produced that sit in The Vault). Imagine if he had been careful about expenses early on. To think he just had to wait for the 20th anniversary of Purple Rain to replenish his wallet with a back catalogue tour is simply amazing (ahhh, 2004...). Like, U know, nuthin' happened. To be fair, this table should also include side projects and other singles composed/produced by Prince. Jeeez, are you lot still getting a hard-on over sales figures?! I agree. He has been semi short-changed regarding this. As if him being as one of the most prolific successful musicians isnt already cemeneted, but articles rarely add on the other hits he is involed in as part of his sales (flr ex: Chaka, Easton, Bangles etc etc) figures. Not sure if your being facetious to make fun of me in snark, but even if you are, those seminal hits significantly boosted the careers of some of these artists. It wasnt simply just givjng them a million sales between them but boosted their cache in sales, concert attendance for those artsist etc. It's evil. It didnt sell any copes. Its the Dream Factory of now. Ah ok. Wasn't a problem if you did, it just makes you more a Prince fan. Sales to the devil dont count. The streaming ratio is a bit strange when all is said and done. For one thing the ratio numbers seem completely arbitrary, it could be anything. Why 1500/1, why not 15 or 15,000? Besides, following that logic why not also count TV and radio broadcasts? Also of note is the absence of NEWS. And what to make of NPGMC/Lotusflow3r memberships? And does Emancipation still count as 3 albums while 1999 counts as 1 on CD/MC and 2 on LP? And what of the countless cassette copies, burned CD's, third world pirate releases and illegal downloads? True...and don’t forget The Time, Sheila E, Vanity 6 which are almost exclusively Prince albums. 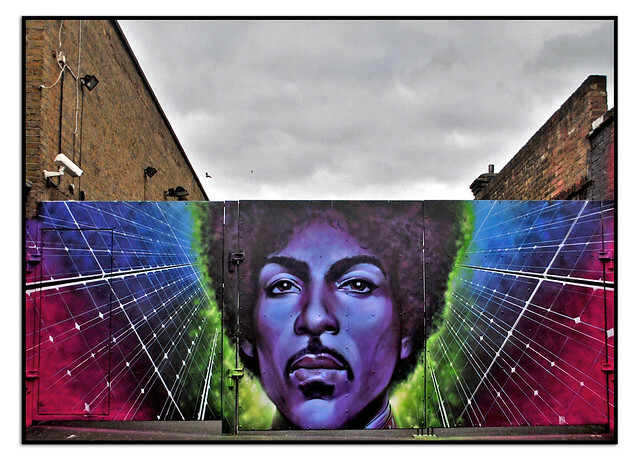 Anaylsis of Prince’s record sales really illustrate his artistic independence and integrity. He truly is a “cult” artist who occasionally got commercially lucky.